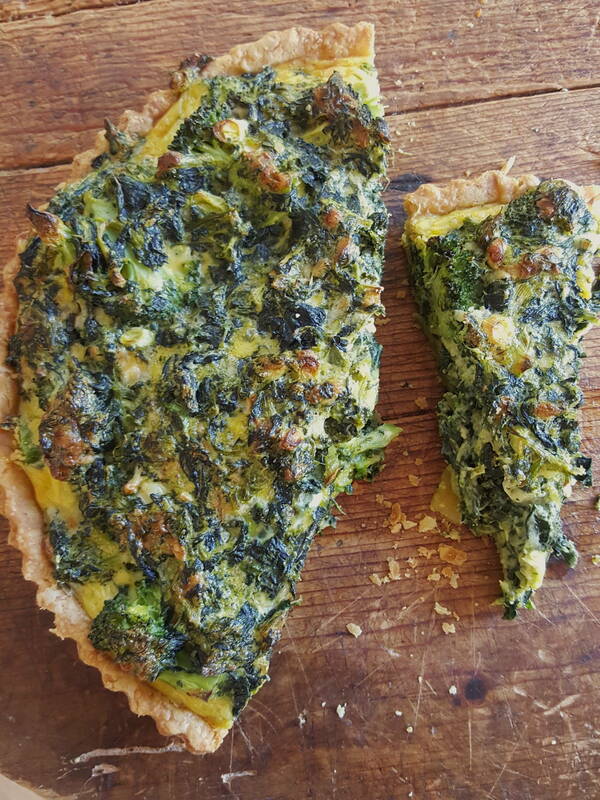 Broccoli & Spinach Quiche: Take your medicine with pleasure. This is a good all-vegetable midweek standby. 1 Make pastry first, in a food processor if you have one. There are plenty of tips here: Rich Shortcrust Pastry. Put flour and salt in the bowl of the processor and add butter. Process quickly until mixture resembles coarse breadcrumbs. Mix egg yolk and water together, pour in, then process just until the mixture forms large clumps. Turn dough onto a lightly floured surface and quickly knead into a ball. Wrap in plastic wrap and chill for 30 minutes, just until firm. 2 Roll out pastry on a lightly floured surface and line into a 23cm (9”) loose-bottomed flan ring. Put flan ring on a baking sheet (tray) and chill pastry until firm. Line pastry with tin foil or baking (parchment) paper and fill with baking beans. Bake pastry for 20 minutes in an oven preheated to 190°C. Remove foil or paper and beans. 3 Thaw spinach according to instructions on the packet. Once spinach is cool, wring out excess moisture. Lower broccoli into a saucepan of gently boiling lightly salted water and quickly bring water back to the boil (don’t cover the pan). Drain and rinse with cold water until cool. Drain, then dry off with paper towels. 4 In a large bowl mix cheese, spring onions and eggs with plenty of black pepper, ¾ teaspoon of salt, nutmeg and crème fraiche. Mix in the spinach, then the broccoli. 5 Spoon into pastry case. Bake in an oven preheated to 190°C for 30 minutes, or until pastry is golden and the quiche browned on top. Serve warm, cut into wedges. Making your own pastry is cheaper than buying it, but if time is short, you can use ready-made shortcrust pastry. It is better to buy pastry in the block though, and to roll it out, because pastry sheets will be too thin for this pie. If liked, team up the quiche with baked tomatoes (either fast or slow roast, or halved, seasoned, dotted with butter and parmesan and crumbs, and grilled), and a winter salad of fennel and baby spinach. Ha! This is really just a fancy-pants casserole with a pastry lid on! If like us chicken is your go-to, why not mix it up a little? Bring on the prawns, broccoli crumbs and feta! make this your go-to dessert when you want a big sumptuous tart to serve at the end of a dinner party.